Fish oil supplementation reduces severity of exercise-induced bronchoconstriction in elite athletes. Mickleborough TD, Murray RL, Ionescu AA, Lindley MR. In elite athletes, exercise-induced bronchoconstriction (EIB) may respond to dietary modification, thereby reducing the need for pharmacologic treatment. Ten elite athletes with EIB and 10 elite athletes without EIB (control subjects) participated in a randomized, double-blind crossover study. 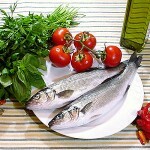 Subjects entered the study on their normal diet, and then received either fish oil capsules containing 3.2 g eicosapentaenoic acid and 2.2 g docohexaenoic acid (n-3 polyunsaturated fatty acid [PUFA] diet; n = 5) or placebo capsules containing olive oil (placebo diet; n = 5) taken daily for 3 weeks. Diet had no effect on preexercise pulmonary function in either group or on postexercise pulmonary function in control subjects. However, in subjects with EIB, the n-3 PUFA diet improved postexercise pulmonary function compared with the normal and placebo diets. FEV1 decreased by 3 +/- 2% on n-3 PUFA diet, 14.5 +/- 5% on placebo diet, and 17.3 +/- 6% on normal diet at 15 minutes postexercise. Leukotriene (LT)E4, 9alpha, 11beta-prostaglandin F2, LTB4, tumor necrosis factor-alpha, and interleukin-1beta, all significantly decreased on the n-3 PUFA diet compared with normal and placebo diets and after the exercise challenge. These data suggest that dietary fish oil supplementation has a markedly protective effect in suppressing EIB in elite athletes, and this may be attributed to their antiinflammatory properties.